Aside from visiting Tombstone, today was mostly a travel and blog day. Petey and I left Las Cruces and headed toward Tucson to stay with my Aunt Diane and Uncle Mike for a few days. On the way, we were greeted by signs such as “Caution, Dust Storms May Exist” and “Zero Visibility Possible”. I was thankful for a sunny day (and so was Zoe). She ran along this part of the highway a few days ago! “The Town too Tough to Die,” Tombstone was perhaps the most renowned of Arizona’s old mining camps. When Ed Schieffelin (SHEF·e·lin) came to Camp Huachuca (hwah·CHEW·kuh) with a party of soldiers and left the fort to prospect, his comrades told him that he’d find his tombstone rather than silver. Thus, in 1877 Schieffelin named his first claim the Tombstone, and rumors of rich strikes made a boomtown of the settlement that adopted this name. Days of lawlessness and violence, which nearly had then-President Chester A. Arthur declaring martial law in Tombstone and sending in military troops to restore order, climaxed with the infamous Earp-Clanton battle, fought near the rear entrance of the O.K. Corral on October 26, 1881. Over the course of 7 years the mines produced millions of dollars in silver and gold before rising underground waters forced suspension of operations. Schieffelin died in Grant County, Oregon, on May 14, 1897, at the age of 49. At his request, he was returned to Tombstone for burial nine days after his death. He was afforded a grand funeral at Schieffelin Hall. He was laid to rest on a hillside about a mile from town (beneath a marker in the shape of a miner’s claim). 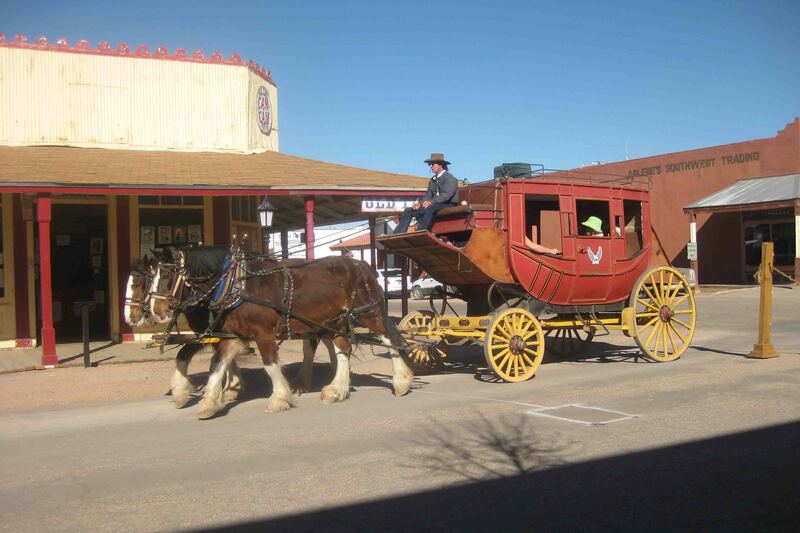 Truly a Historical American Landmark, Tombstone is America’s best example of our 1880 western heritage, which is well preserved with original 1880s buildings and artifacts featured in numerous museums. set up several miles from the border on all the main highways. As I approached the station, I followed the posted signs: NO PASSING, Speed Limit: 55, 45, 35…As I’m slowing, Cowboy Bob or Vaquero Paco (I didn’t get a good look), in his oxidized, gold Buick, crossed the double yellow lines and passed me at 60, just to stop at the station! Nutty. I’m so glad you had a nice visit with Aunt Diane and Uncle Mike! And I love Diane’s photo!! !